What are Job Postings? What advantages does Naukrialerts Job Postings offer? How can I register as a company? From the Naukrialerts.com click on the “Employers” on the top right corner. The fields marked with a red asterisk are compulsory. Once you have completed the process you are then registered and can begin posting offers. How can I post a job on www.naukrialerts.com? To post a job, you need to have a recruiter account with Naukrialerts.com. Once you have an active account, you can logon to your account and get to the job posting form by clicking on “Post a Job”. Once you have filled up the one page job posting form, preview and post it. Once a job is posted, all candidates matching your job criteria will receive a Job Alert email with your job details. This will help in getting the maximum response to your posting. Naukrialerts may modify, reject or remove any job postings for any or no reason. Can I edit my job posting? Yes,you can edit your job listings from the Manage Jobs section. Find the job you wish to edit using either the search or other filters available on the page, and clicking on the Modify icon in front of that job. For how long will my posted jobs remain advertised on the site? All jobs remain active on the site for 30 days from the date of the publishment. How soon will a job advertisement appear on your site once I have posted it? Usually it takes 24-48 working hours but once an admin approves the post will reflect on the site. How do I know the number of job postings left in my subscription? 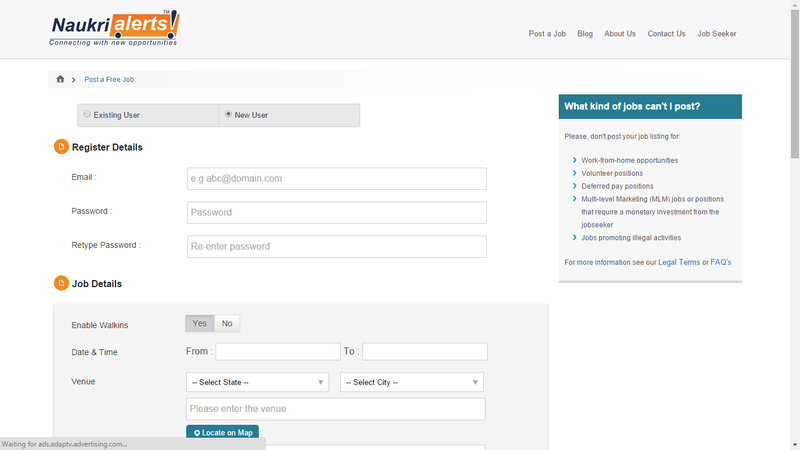 You can view this information on the right side of My Dashboard, Post a Job and Manage Jobs page. What happens to my job after 30 days? The jobs that had been on site for more than 30 days are automatically expired. You can choose to repost expired jobs at any time. How do I view the applications/responses received for the job that I've posted? When a candidate applies for your job vacancy, you will receive the application in your private account. 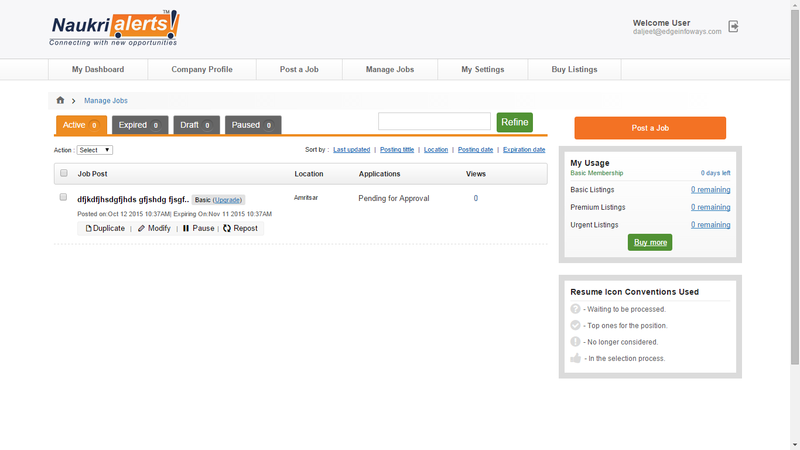 You can see the applications received in the dashboard. How do I remove my job from your site? To remove a job, go to the Manage Jobs section, select the job you wish to remove, and then click on expire button from the top of the job listing section. Your job will be expired and removed from the site. Naukrialerts.com shall not be liable for any payment made to any party other than Edge Infoways Pvt.Ltd. It seems like their is some network error. We regeret this inconvineience and request you rferesh your browser or try after sometime.